My best 56th birthday present to myself was taking a big stretched canvas out of the basement. Digging out my old acrylic paints and diving in. You see, I’ve had this canvas for 13 years. Afraid I didn’t know how to paint anymore. I gave myself permission to make an ugly painting. After all, can’t the birthday girl make a colorful mess if she wants? I was also listening to Apple music and finding tunes I haven’t heard since my teens. On came Cat Stevens. I realized I never understood that line 40 years ago. Now, it makes me yearn for what might be. If only I remain brave enough to continue to follow my dreams. Especially as the months and years race by me faster than ever. If you can relate to this, I hope you’ll post a comment and let me know. Please continue to push yourself out of your own comfort zone. Try new things. Do what you can to uncover those creative jewels living inside of you too. We only have one life, let’s make it an adventure! Be the first to grab a f’ree pass to a mini course I’m offering live by telephone conference call on Nov 10. 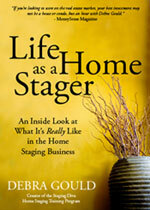 – More proof that home staging works. – How to make more with holiday decorating. – About the latest home staging job posting.